Surrey lawns is something we have perfected over the years with ground preparation be the key to any garden lawn. With Surrey having predominantly good soil it is important to condition it very slightly. 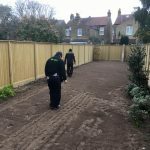 Cutting Hedge garden lawn care offer a full report on any lawn, after a pre inspection we can then advice you best on the solution to gain a healthy lawn. Traditional lawn installations involve a turf cutter and rotavator these tools help with achieving a thick green living carpet to enjoy. After removing the old weed infested lawn with a turf cutter we will begin to rotavate it adding in our first layer. This layer consist of your old soil and cutting hedge turfing sub soil mixture. Once we are happy with the sub layer and all drainage issues have been future proofed we begin to add Cutting Hedge Blended Loam layer with a Grade B topsoil. Grade B topsoil is better than Grade A as it does not hold any organic matter only rich nutrients as Sulphur, potassium and Iron found deep down in the soil. All our soil is fresh and fertile. Organic matter can be more harmful to newly laid lawns as earthworm casting will pair as they digest all the organic mater causing a muddy patchy lawn. Oxygen is a key at this stage so proper rotating and levelling will begin to get you a even bump free surface. If the sub soil has been contaminated we can add our special Cutting Hedge fertiliser to this soil layer which will feed the roots for a added 6 months. After rolling our turf down we will double check its all fresh and green, watering it and making sure the turf sod is completley wet. 1- to 14 days later we advice cutting a 3rd off and doing this againg every 3 to 4 days until rooting has taken place. Cutting Hedge Surrey Lawn care service we can maintain the new lawn along with feeding, aerating, scarifying and keeping you new lawn looking good for years to come.